Are you ready for the imminent release of Mac OS X 10.7 Lion? We have just released an update to our screenshot utility Sharpshooter 2 which makes it compatible with the new OS. Be sure to get the latest 2.0.1 version for a seamless transition to Lion. If you purchased Sharpshooter 2 from the Kerlmax website, just choose "Check for Updates" from within the app to easily download and install the 2.0.1 update. For those that bought Sharpshooter 2 from the Mac App Store, we are sad to report that the 2.0.1 update is still "In Review" at Apple which means that it may not be released before 10.7 becomes available. Hopefully it won't be too much longer before the update appears on the App Store. Customers still using Sharpshooter 1.x should be aware that we are no longer releasing updates for that product. There are issues which prevents it from working properly on Lion. It will still work on Mac OS X 10.4 through 10.6; however, we encourage you to try out version 2 if you are running 10.6.6 or later. You can download Sharpshooter 2 from the Kerlmax website and try out the new features with its 30-day trial. Upgrading is only $8 USD and can either be performed with the "Purchase License" button within the app or by visiting our store on the website with your browser. Austin, Texas - June 27, 2011 - Kerlmax LLC today released Sharpshooter 2.0, a major upgrade to its screenshot utility app which gives you finer control over using Mac OS X's built-in key combinations. If you take screenshots to capture what's showing on your monitor, you owe it to yourself to see how Sharpshooter can save you time. The major new features of Sharpshooter 2 are the automatic processing options. In addition to the previous version's manual features which received a Mac Gem award from Macworld, Sharpshooter now lets you automatically rename screenshots with your own naming scheme, move them to folders, change the image file formats, and open them with other apps. Several other features were added to improve usability and fulfill feature requests. When Apple released Snow Leopard, they changed the default naming of screenshots from "Picture 1" to a slightly more descriptive format like "Screen shot 2011-04-01 at 12:00:00 PM". Sharpshooter takes this a step further and lets you manipulate and process a screenshot while it is still fresh on your mind. After taking a screenshot, Sharpshooter can present the new image to you in a window where you can quickly file it away into any folder, change the image file format, and rename it to something descriptive and memorable. Don't let a bunch of generically named screenshots collect on your Desktop. Let Sharpshooter help you organize them. After a few days, are you going to remember why you took "Screen shot 2011-06-01 at 11.25.44 AM" or that "Screen shot 2011-06-02 at 3.09.01 PM" is a picture of your upcoming vacation's flight itinerary? Sharpshooter 2.0 is priced at $15.00 (USD) and can be downloaded and purchased from the Kerlmax website. The app from the website has a free thirty day fully functional trial period for users to explore before buying. Sharpshooter is also available for purchase from the Mac App Store. Registered owners of Sharpshooter 1 are eligible to upgrade to the latest version for just $8.00 (USD). Anyone who purchased after April 1, 2011 will receive the upgrade for free and will be notified automatically via email. Kerlmax LLC is a small software company located in Austin, Texas. Founded in 2008 by Isaac Wankerl, Kerlmax focuses on exciting and intuitive products for the Mac and iPhone platforms. Copyright 2008-2011 Kerlmax LLC. All Rights Reserved. Mac and Mac OS X are registered trademarks of Apple Inc. in the U.S. and/or other countries. Kerlmax LLC has released an update to the Sharpshooter screenshot tool. This new version 1.2 addresses a couple of issues that were causing the majority of support emails. Some users have customized their system to use a non-default name for their screenshots. With Snow Leopard, instead of taking one named "Screen shot 2011-02-06 at 12.32.09 PM.png" it might be named something like "Picture 2011-02-06 at 12.32.09 PM.png". Previously, our suggested workaround was to go back to using the default screenshot name and we provided a small application to change the setting. Now users without the default setting will be able to continue using Sharpshooter. Users can test out Sharpshooter with its thirty day fully functional trial. Once the trial period expires, certain features become unavailable. Many users wrote in wondering why the user interface was disabled and locked as the application didn't provide an explanation for the change. With the new version, unregistered copies show a button along the bottom of the renaming window that will countdown the remaining days in the trial period. Clicking on the button sends you to the store so you can purchase a license. This will likely be the last version of Sharpshooter before the next major release. Sharpshooter 2 is being rebuilt from the ground up. The new app will be dropping support for older OS versions and will require Snow Leopard. Our current plan is to have the app available for purchase from the Kerlmax website and through Apple's Mac App Store. Hopefully it won't be long before it's ready for release. Lately we've been working on an iPad version of our Austin Traffic iPhone app. It's been a lot of fun as the larger screen size and new user interface elements has made us rethink how we can present the traffic information to you. Most of the functionality is in place now so we're fixing bugs and refining the look. The app will be shipped as a Universal binary so it will work on iPhones, iPads, and iPod touches. It is also just a regular upgrade so if you already bought Austin Traffic, you'll get this new version 3 for free. We also have a brand new icon designed by Trevor Lemoine which looks great. Based on the past week, quite a lot of Austin Traffic users have the iPhone 3GS model (about 62%) and the majority of the rest have the iPhone 3G (about 32%). There have been some iPad users but not too many yet. Hopefully that will change before too long because the app is amazing on the iPad. One more data point we'd like to share with you is a graph of when people are using the app. Understandably, the peaks are at the morning and evening rush hours. In about a month I will be presenting at Austin's Capitol Macintosh user group October general meeting. Sharpshooter 1.1 will be final shortly and this will give me a great opportunity to show off its features to the group. Lately I've been making a conscious effort to do a better job of marketing my products and CapMac has been a wonderful tool so far in this respect. 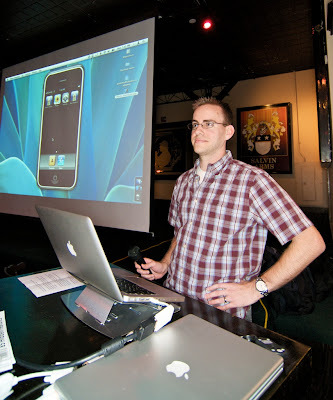 Back in January I got an email from Michael Sidoric asking if I would like to demo Austin Traffic at their first iPhone Special Interest Group meeting. At the time the app only showed traffic incident listings but enough work had been done to show off a prototype with traffic cameras. The new feature was well received and I got several good ideas from the group. I've since been back to several of the iPhone SIGs. Photo courtesy of Alex Suarez.